This last week has been shaped by the bounty from our garden. When the tomatoes, peas, beans, zucchini and cucumbers are ripe, they get picked NOW … it’s not something that can be put off for a day or two. Of course, having the picked vegetables means that you have to do something with them before they go bad – so I’ve been prepping and canning lots of pickles and making zucchini bread for the freezer. 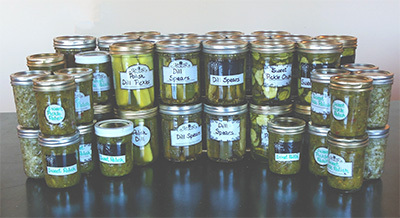 Pickles – well, this MANY pickles, anyway – are new. I decided to try several different recipes and then keep track of which ones are good, better, best (or really bad). Casting about for a way to keep track of it, I realized that it’s just one piece of good manufacturing practices .. and I already know how to do that! For each batch of pickles, I wrote down the recipe (I’m keeping them in Evernote). I now have several recipes for each of several different kinds of pickles. Those are my “master recipes”. My goal is to try each master recipe with different combinations of spices and types of cukes to see which turned out the best. To prepare for each batch of pickles over the weekend, I made a copy of the master recipe being used (as a new note in Evernote). That was my batch record. As I made the batch of pickles, I noted type type and size of cukes, and the type of pickling spice(s) being used. I also kept track of how the process went (some had leftover pickle juice, some didn’t have enough — now I’ll know next time). Finally, when the batch was completed and cooled, I made labels for each jar. I found these great printed shrink-bands at Bi-Mart, which let me put the name on the front and additional information on the back. On the back I put the batch number. It will be a few weeks before we can open up the pickles and start trying them out. My plan is to note the batch numbers for each jar as we open them, and then make any notes about the end result right in my Evernote note for the batch. I’m pretty excited about the system. In the past, when it comes to canning it’s been, “Now, which cucumbers were the ones that made that great relish? Did I get those spices here or there?” I’m never quite sure if I’m remembering it right. Next year, I’ll be able to pull up my Evernote notes and see what worked (and what didn’t) – no trying to remember! For the first time, I’ll be able to improve on what I learned, not have to learn it all over again. When I first started researching good manufacturing practices it was for making soap and cosmetics. And, of course, when you’re making soap and cosmetics you SHOULD have your GMP in place and be following your practices and procedures. But there are aspects of GMP, especially the record-keeping, that feed into many areas of similar activities – like making pickles!